White tea, lemon, bergamot, and ginger; blended with subtle notes of rose, nutmeg, geranium and berries. A beautifully light and refreshing fragrance! Handmade using the hot-process method of soapmaking our soaps retain all of the naturally occurring Glycerin; a wonderful humectant that leaves your skin soft and conditioned. We have added skin conditioning Tussah Noil Silk Fibre and fresh yogurt to this soap bar for extra skin soothing benefits. 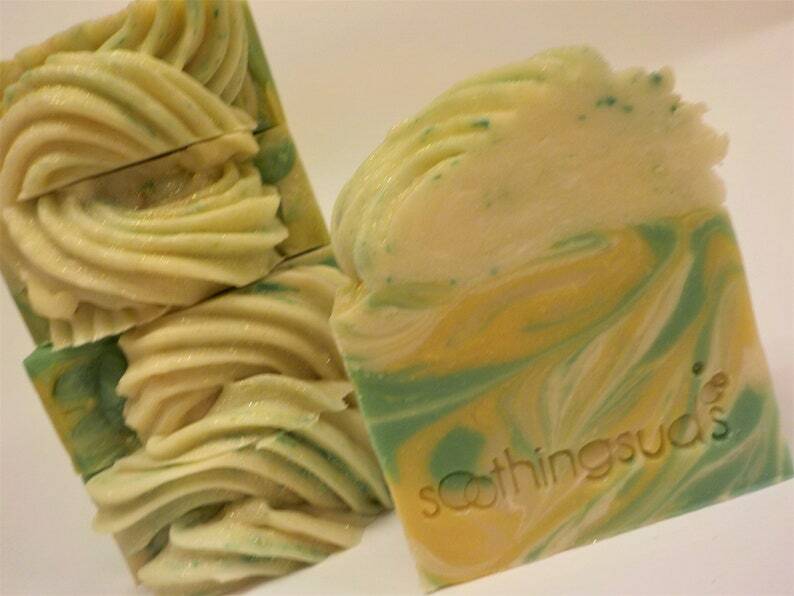 Our finely crafted Olive Oil & Shea Butter formula makes a deliciously rich bar of soap that gently cleanses with lots of thick, creamy, silky lather....for pure soaping bliss! Weight: These bars are BIG;) 6oz. net wt. This listing is for (1) bar of soap. Each soap comes wrapped and labeled. Please note that our Artisan Soaps are hand cut so actual weight may vary slightly. Soap color/designs may vary from batch to batch-- that's the beauty of handmade! Ingredients: Tallow, water, Lard, coconut oil, sodium hydroxide, Olive oil, Castor Oil, stearic acid, shea butter, sugar, fresh yogurt, fragrance, sodium lactate, Tussah Silk Fibre, mica, mineral pigment, and/or candy sprinkles and/or body safe glitter. USPS priority padded envelope fits up to 8 soap BARS/bubble bars! ** Note that all excess shipping charges exceeding $2.00 will be refunded to you. Due to the nature of bath & body products, no refunds or exchanges can be given. Ultimately, I want my customers happy. If you have a problem or concern, please contact me & I'll do my best to resolve it fairly. To avoid damage & loss by USPS, please insure your purchase for the actual value if your order value is greater than $50. We use United States Postal system for most all packages- flat rate envelopes and boxes are my favorite:) Fed-Ex or UPS available for large orders or upon request/if better rates are available. International customers - Contact me directly and I can create a reserved listing for your items automatically reflecting the flat rate postage for you. I will gladly ship small items that will fit nicely/safely into the flat rate box/bubble envelope for the best bang for your postage buck ($7.50)! This does not apply to Soap Cupcakes as they need to be boxed. I charge a small handling fee up to $2 for most/larger orders to help cover costs for packing materials. We pack our orders responsibly to withstand some shipping abuse, but insurance is recommended for the actual value of your package. If we file a claim on your behalf & USPS is at fault for damages, you're covered for a maximum of $50 unless you pay for insurance for the actual value of your order. Please insure your packages if valued above $50! I am able to make custom orders. Inquire if you are interested.